This is one of those fulfilling routes that offers a bit of everything for everyone. Starting from the exciting port of Bodrum, Turkey; your blue voyage takes you into the southern Dodecanese islands of Greece and then brings you back into Turkish waters to absorb continuous scenery, turquoise waters, local village life, and much more. The day morning of your blue cruise ends with a beautiful Turkish breakfast, followed by a transfer (arranged separately), from the port of Gocek to Dalaman Airport – a mere 20 minutes drive. This itinerary has proven to be one of the best and most liked by travelers. However it is not available by all gulets and based on booking schedules and base ports of boats. Embarkation begins at around 15: 00 to 15:30 hours. If your yacht is prepared sooner, then arrangements can be made for you and your guests to board sooner. Once everyone has found the cabin that best suits them, then it’s time to raise your glasses for a welcome on board toast to your gulet holidays in Turkey; followed by a briefing explaining your trip, the boat, the crew and answers to any questions anyone has. If you haven’t been to Bodrum before, you might like to check out the Bodrum St. Peter’s Castle (build by the crusaders in the 15th century) located right at the harbor. Who knows, it might just be across from the gulet you’ve hired. Lined along this area are vendors with unique and traditional gift items that you might like to buy to take home as souvenirs. Also located at the harbor is the impressive Museum of Underwater Archaeology and is host to numerous cultural festivals during the year. This interesting harbor city was known as Halicarnassus of Caria during ancient history and famed for the Mausoleum of Mausolus (one of the seven wonders of the ancient world). The Bodrum region is situated at the tip of the Gulf of Gokova and recognized as one of the best sailing areas in Eastern Europe. Diverse and abundant in many aspects, filled with villages, lush green hills, beautiful private bays and coves, it is an area unspoilt and rich in nature – making it ideal for a variety of activities both on land and in the water. With a short cruise south from Bodrum, travelers will find the cosmopolitan island of Kos. There’s something for everyone here. A bit of history, nightlife and entertainment, beaches, and a popular harbor to visit. Kos is the 3rd largest island in the Dodecanese. A place of interest you might like to see is the ruins of Asklipios – Castle of the Knights and the tree of Hippocrates, measuring 11.5 meters in diameter. 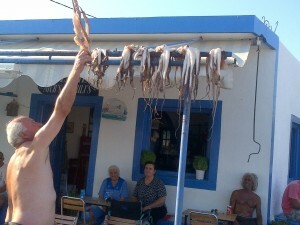 On this day you will dine on board followed by an overnight stay at a bay in Kos Island. Alternatively, if you arrive early enough on the first day, you could leave for Kos right away and spend the night there. 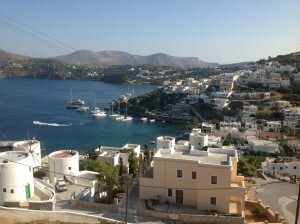 Then on day 2, cruise to the charming island of Symi instead. It takes approximately 6 hours to travel from Kos to Symi – and not all boats will do this. So please check with your captain or agent. If you prefer to skip Kos, then on your second day, you could cruise to Knidos in the Datca peninsula instead. Knidos remains to be one of the most interesting ancient cities in Turkey – situated at the tip of the peninsula. A must-see! It was known as the first settlement on the eastern side of the Datca peninsula. Presenting a unique beauty visitors can find themselves exploring this large site with a theater by the harbor, followed by a short walk which takes you to the the remains of two chures built during the Byzantine period. Many statues have been discovered here where some are now in the British Museum. The sacred temple of Aphrodite – although not completely there; the double harbor, a huge necropolis, are favorite attractions. 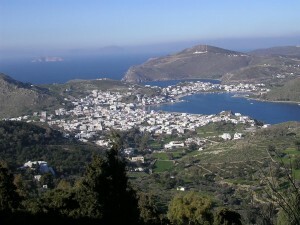 Followed by a trip to the town of Datca (founded by the Dorians), you will enjoy a beautiful dinner and overnight stay. 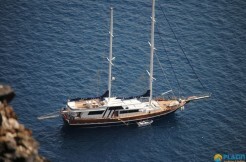 A great place to watch the stars from the forward deck of your gulet! The historian Strabo quoted “God would send his beloved servants to Datca to live longer”. This is perhaps because Datca has very low humidity with plenty of oxygen due to its location. Things to do in Datca: shopping, enjoy a few drinks at one of the little local cafes and enjoy the views from the harbor. If you’ve opted for a night in Kos on the second day, then following this route, day 2 will land you in the ever-so-sweet island of Symi, adored by thousands of visitors each year. After your customs exit in Datca, your gulet will cruise to this beautiful Greek Island for the day. Symi is renown for is attractive harbor where from the distance you can see the delightfully colorful pastel colors of the Venetian architecture in Symi houses on the hills. This island was once one of the most prosperous islands of Greece. There is practically no modern construction found – as it maintains its charm and allurement. You will spend the whole day here and might like to rent a scooters to explore the island, see the churches and absorb the stunning views from the hilltops. An overnight stay and dinner will be served. It’s a long trip from Symi to Rhodes, and therefore you will most likely leave Symi quite early in the morning to enjoy a full day and night in Rhodes. 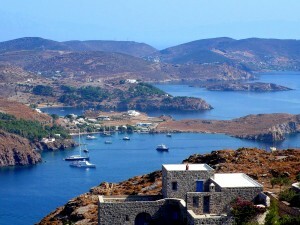 This island is the largest of islands in the Dodecanese. It offers travelers sunshine a good part of the year with its subtropical climate. A popular holiday resort, attracts not only tourists from around the globe but also local. Filled with history, authentic culture and ancient sites, Rhodes has a bit of everything. Breathtaking beaches, beach clubs, tiny islands nearby, private bays and convenient flights from Athens or other countries to the Rhodes airport, you could possibly start or end an itinerary on a Turkish gulet, even from Rhodes (depending on the gulet and booking schedule). The Rhodes city is surrounded by 12 meter thick walls where the Medieval town is situated. From shops of all kinds, you are spoilt for choice in buying something special to take back home with you. Explore the sites, visit a taverna or two while indulging in delicious Greek cuisine, then end your day on board your charter boat with a beautiful sunset and cocktails before and after dinner, followed by an overnight stay. This day takes you back into Turkish waters. After a customs entry in Marmaris, why not explore the harbor front shops, bazaar, and stroll over to where the locals shop on some good deals along the boulevard. Marmaris was a part of the Carian civilization. There isn’t really any ruins to see, except perhaps the castle located in the Old Town at the harbor (seen as you enter the Marmaris bay). However, water sports activity choices are certainly plentiful. From parasailing, water skiing, jet skiing, ringo / hamburger and banana boats rides, there is much to do in gulet heaven Marmaris. At this point you could also stay overnight in Marmaris, if you are looking for some nightlife on Bar Street – also steps away from the harbor. Your trip to Ekincik could be the following morning after breakfast. Afterwards, this same day you will be visiting the peaceful bay of Ekincik – an hour away from Marmaris. Ekincik bay offers a small tranquil beach, from where you could take up a walking trip on the coastal road. It stretches 2 km to a gravel beach in a small harbor where the river boats depart to the town of Dalyan. Alternatively, from this bay, there are small boats called Piyades’ available to take you through the amazing Dalyan Delta. Places to see could include the ancient city ruins of Caunos with impressive views from the hilltops, and a glance across the Dalyan river of the Lycian King Rock Tombs (one of the most photographed sites in Southern Turkey). The cost for the “piyade” ride through the Delta, the entrance to Caunos are small extras. 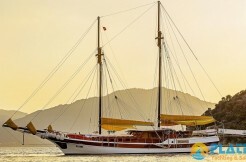 After your excursion, the piyade brings you back to your gulet. From this point, your travels will bring you into the Gulf of Fethiye, filled with many little islands and islets, with short trips between each beautiful destination – until your last day where you will disembark in the small and charming port of Gocek. Shortly after a beautiful breakfast, the gulet continues to the uninhabited Domuz Island (sometimes referred to as Prince Island). It is a popular mooring spot by both charter boats and private ones. A lovely setting for some swimming and snorkeling. Following a nice rest, the gulet will cruise to another unhabited island called Tersane. It is the largest island mass in the Gulf of Fethiye and accessed through a deep 100 meter channel. There are a variety of sheltered bays on the east side as the west side is generally closed off due to the high winds. Once upon a time, this island was called Telandria. If you opt for an explore, you will see ruins of what were once houses. The island was preferred by sailors and considered safe during the Byzantine period. Followed by the 1922 Treaty of Launsanne; many migrated to Greece and other places. Here you will spend the rest of your day, relaxing and doing as you please, followed by a dinner and overnight stay. When translated, Zeytin means “olive”. It is located souther of Yassica Island. Once there, you will understand why they named the island “Zeytin”, as it is blanketed with Olive trees. It is known to be owned privately. There is a olive oil workshop, last behind from the Ottoman times. The Yassica Island is considered to be one of the most romantic islands in this cluster of islands near Gocek. Sunsets are amazing. The island is covered in pine and olive trees and favored among water sports enthusiasts as the bays are shallow, sheltered and ideal for a variety of water sports acttivities. 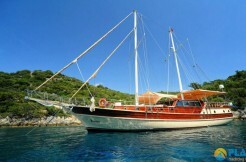 Again in this group of islands, another place your charter gulet will moor at is Kizil Island. A serene and idyllic atmosphere. Kizil when translated means “red”. Apparently when the sun hits the stones, they t urn a crimson red – resembling the islands’ soil. There is no real inhabitation with few infrastructure, except for a lighthouse for maritime traffic. It is a superb place for enjoying some time in the water. After visiting these picturesque places, it’s off to the port of Gocek for a final dinner, perhaps sharing your memories at the table, and an overnight stay under the sparkling starry night. Well today it’s time to pack, get ready for your continued travels elsewhere or home. After a lovely breakfast, it’s time to disembark. The crew can assist you as well. Make sure you have everything – as guests sometimes tend to leave something behind. Bid your farewells – while we hope that you have had the best vacation ever from the Aegean shores of Bodrum, into the lower Greek Dodecanese and finally the Mediterranean of Turkey in the town of Gocek. This route is designed for private blue cruise charter holidays and not a shared cabin cruise itinerary.